The Black Heart are beyond excited to be hosting a monumental, once in a life time show next week. 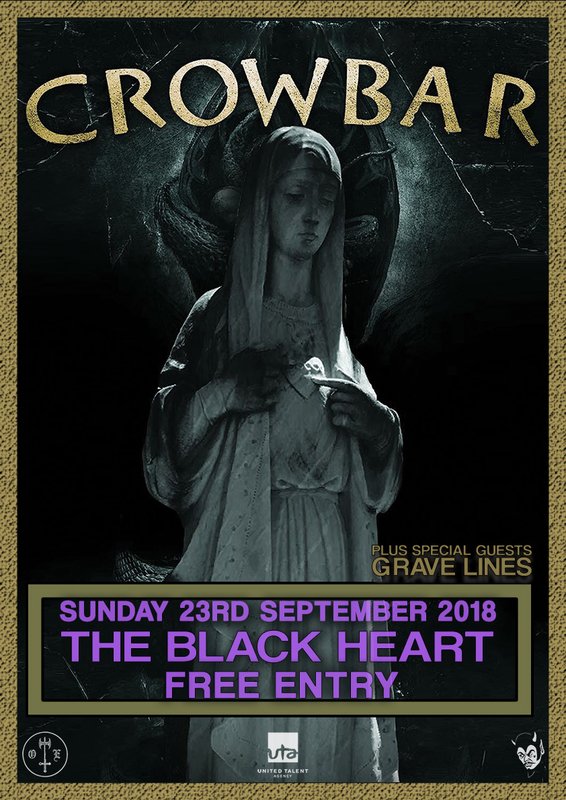 NOLA sludge legends CROWBAR will be playing a FREE show at our venue on Sunday 23rd September. With a career spanning almost 30 years, Crowbar are not only masters of their craft but have set the standard for an entire genre of music. Creators of some of the most thunderous riffs ever written, Crowbar were born from the very beginnings of the NOLA scene, with more comrades and musical projects throughout their iconic career than most could ever dream of. And despite an array of line-up changes over the last 30 years, Kirk and his crew have always managed to not only define, but seamlessly refresh, their unique sound - keeping things at an otherworldly level of heavy and repeatedly showing the young bucks how it’s truly done. Crowbar’s recent live performances have been met with purely rave reviews; with revellers hailing the latest set lists, atmosphere and musical line-up as some of the best of their career. It’s no easy feat trying to picture these titanic warlords of sludge in a 170 cap venue… but we sure as hell can’t wait to witness it. They will be joined by London’s very own GRAVE LINES. Just don’t forget to get down early - because it’s first come, first served… so yeah, we wouldn’t blame you for camping outside The Black Heart from the early hours. Plus if this night wasn’t going to be mental enough already, we have got the mighty Ben Ward from ORANGE GOBLIN DJing until 2am, so pace your livers and your minds… it’s going to be a big un’.